Every graduate student is faced with the seemingly eternal dilemma of “academia vs industry”. Which one do you pick? I struggled a lot with this false dichotomy throughout my studies and would switch camps from one day to the next as I tried to decide. As I “grew up”, I saw the antsy-ness in the spouse at wanting a family, and I myself had an incredible need to feel “settled-down”. I wanted a life whose furnishings weren’t selected based on how easy they are to take apart and reassemble for the next move. I started leaning towards a career in industry. I made up my mind sometime in the 4th year of my PhD, after I recovered from the “why on God’s green earth did I get into this mess”-phase? (This phase is experienced by every grad student I know, somewhere in their 4-5th year, where they want to quit and question their poor life choices. I only got through my slump because the spouse drove me to work everyday and forbade me to quit. Literally). I noticed at that point that my supervisor’s primary role was to write grants. I only saw him in the lab when a big paper was about to be published, and journalists came into the lab to take his picture. I decided that I loved lab-work too much and that grant-writing wasn’t the right career for me. On top of that, I did the math and realized that I’d probably be close to my 40’s by the time I was earning enough money to own a decent place with my own washer and dryer. I didn’t tell my supervisor nor did I tell my committee members. I knew that there were some in academia who would consider my choice to have been “selling out”. But I always thought that if I had made the “wrong” choice, I could always go back to academia. Never in my wildest dreams did I think that my choice would represent my ethical standards to the world around me. As I read comments and criticisms about the biotech industry, about how X study cannot be trusted because it came from a company or was funded by such-and-such, it baffles me that the choice that I made has made me less ethical in the eyes of the public. Somehow, I sold my ethical standards to the highest bidder when I started working in a commercial environment. Universities do not have a litmus test to measure your ethics. Companies do not have a compass that will help them determine the direction of your moral standards. As such, there are unethical individuals in both areas. More importantly, there are many individuals with a clear sense of what is wrong and right. Science is science. Crummy science can be produced in publically funded labs. Amazing studies can be published by individuals affiliated with an industry. There are many examples of both. I’m not going to review the paper, because Dr Kevin Folta’s blog expresses every thought I had about it and much more. The purpose of this post isn’t even to debate whether the statement cited above is accurate. It’s to argue that even if it is, it shouldn’t matter. In biotech, and tech in general, industry sectors are becoming more and more inbred; meaning that everyone has worked everywhere. Try finding someone in Silicon Valley who has worked for a single employer! It’s nearly impossible. Yet somehow, people are under the impression that if you work for someone for 2-3 years at some point in your career, the company owns part of your soul and can summon you to perform dirty work at the drop of a hat. Don’t you want someone who worked at Oracle to fix the database issues at the Veteran’s department? Don’t you want someone who worked at Google to build the next government-funded website? Or do those experiences somehow bring loyalties into question? Then why would someone who worked at Syngenta not be a great candidate to work at the FDA? Or why should I not dream of working at the NIH or Office of Science in the later years of my career? When my son, Mr Chubby-Cheeks, was around 18 months, he started noticing my absence when I went to work. My husband decided that the best thing to do would be to teach him the value of what I do so that “Mommy’s at work” wouldn’t become some dreaded place that sequesters one of his parents. So my kid has learned to say “Mommy is a scientist. She makes the world a better place”. As cheesy as it is, I remember tearing up the first time he told me that. I know that it’s the mantra for many researchers and scientists, in industry and academia alike. Yet somehow, it is thought that a cold gloom was cast upon me and my mantra changed to “she wants to destroy the world” as I signed my employment documents (which of course, is the Secret Oath of every scientist). And I don’t even work in Big Ag! I can’t imagine the stigmas that they have to deal with!! As I read papers and note flaws in their design, particularly studies that use technologies I’m very much familiar with, I genuinely wish that there were more collaboration between industry and academia, because they could help each other so much. But so long as this false dichotomy continues to prevail in the minds of the public and the perceived risk of tainting science remains high, then I understand why it doesn’t happen. Howdy y'all, if you missed my post earlier this week, it was about the GMO labeling law in Vermont, the lawsuit that has come about as a consequence of the law, and the fundraising campaigns which claim that Monsanto is suing Vermont. The four plaintiffs in the lawsuit are The Grocery Manufacturers Association, Snack Food Association, International Dairy Foods Association and the National Association of Manufacturers. I could not find reliable information indicating that Monsanto was a member of these organizations. I claimed that fundraising campaigns, particularly the campaign led by SumOfUs.org, is misleading the public by stating that the funds will be used to "lead the fight against Monsanto". I wanted to provide you with the membership list from the GMA's website, before it was removed earlier this year, to confirm that Monsanto is a member. It's attached. I'd also flag that in a political fight over labeling that did require disclosure, the Washington state ballot over labeling of GMOs, Monsanto contributed more than $5 million to the campaign to defeat it, while the GMA itself donated more than $7 million. GMA only disclosed their donors (as required under WA law) on that campaign after the WA Attorney General sued them to acquire that information. Unfortunately, federal disclosure laws governing where GMA's funding comes from are not as strong. It is clear, however, that both Monsanto and the GMA are prepared to spend large sums of money defeating labeling laws that do enjoy public backing, as in Vermont, and that their interest in transparency is minimal. They included an attachment with a table of GMA's membership. The list is huge and includes Monsanto, as well as Syngenta. Every food manufacturer that you can think of off the top of your head is probably listed, as well as some members or associates that you wouldn't think of, such as VWR, Oracle, and Microsoft. I went to the Attorney General's website for the state of Washington to find out how much Monsanto had contributed to the campaign through the GMA to defeat the labeling law in Washington. The list of contributors can be found here. Monsanto's not on the list, but it doesn't really matter since they contributed 5 million dollars separately. Seriously. The amount of money being spent on all of this is pretty disgusting. I wrote to Monsanto directly to confirm that it's a member of the GMA. Their response simply stated: "Monsanto is one of the more than 300 member Grocery Manufacturers Association (GMA)." I'm of two minds here. I absolutely agree with SumOfUs.org that contributions should be disclosed because it's hard to know what all parties are doing. But for that very same reason, we do not know if Monsanto is the primary donor to the GMA for this lawsuit. Consequently, the fundraising campaign that SumOfUs is driving is misleading (I might downgrade the campaign from misleading to sleazy :) ). If one reads the description of the lawsuit on SumOfUs' website, one would think that Monsanto's name would be front and center on the list of plaintiffs. In chatting about this with the spouse and with friends, none of us have any doubt that the reason why Monsanto's name is touted is to drum up support in fundraising efforts. After all, SumOfUs could equally say that Syngenta is suing Vermont, or even the Texas Department of Criminal Justice (who is also a member of the GMA, according to the list I received... who knew??). But neither of these have the same ring to it or evoke the same feelings as "Monsanto", much less America's beloved companies such as CocaCola or Mars. Someone's train of thought might be "Mars --> Snickers --> Snickers' SuperBowl Ad --> Betty White --> Betty White is suing Vermont? I love Betty White!!" SumOfUs.org should not be singled out in this tactic. MoveOn.org has several petitions hoping to "block Monsanto from suing Vermont". The Organic Consumers Association is raising funds to "help defeat Monsanto and the GMA". It seems pretty clear that the reason why Monsanto is being used is to play on people's sentiments and biases against the company. My concluding thoughts here are against Monsanto. I understand why Monsanto is defending its products and its customers. If GMO sales drop, it's not only Monsanto who is impacted, but many farmers as well. So there's a lot at stake and I really get it. But my opinion is that, instead of spending all this money on political campaigns, the money might have been better spent educating the public about the company's technology. Frankly, I don't see the labeling debate going away anytime soon, and Monsanto will continue spending money out the wazoo to defeat these efforts, unless they educate the public about their products and about genetic engineering. The more money Monsanto spends in political campaigns will only entrench the publics' negative views about them. Sponsor an episode of Cosmos!!! Well, that's all I've got on this story... Feel free to share your thoughts and comments below. Next week, I'll return to my ongoing series about the use of NGS technology in studies examining if DNA/RNA from our food have any impact on us. I'll also be potty training the kid (looking at these numbers and the money wasted has left me thinking of words associated with 'potty'). Monsanto is suing Vermont? Whaaaaat?? I've seen a whole bunch of articles about how the the "Mighty Monsanto" is taking the "tiny state of Vermont" to court over its labeling laws. To recap, back in April, Vermont passed a law mandating all foods to be labelled if they are made with genetically modified crops. The law is to take effect in July, 2016. I promised the spouse that I wouldn't write another article about labeling because, as he so eloquently put it, "it's such a divisive topic that it won't be helping matters. Unless you write an article about how a label should be written". As Barney Stinson would say: Challenge accepted! But this article isn't just about labeling. It's also about the law in Vermont and the fundraising campaigns to "help defeat Monsanto". When Vermont's labeling law was enacted into action, there was a section entitled "Genetically Engineered Food Labeling Special Fund" (text of the law is here). If you read the text of this section in the law, they were expecting a lawsuit and many analysts stated that a lawsuit was almost inevitable. The Attorney General stated that "he had advised lawmakers as they deliberated that the law would invite a lawsuit from those affected 'and it would be a heck of a fight, but we would zealously defend the law'." 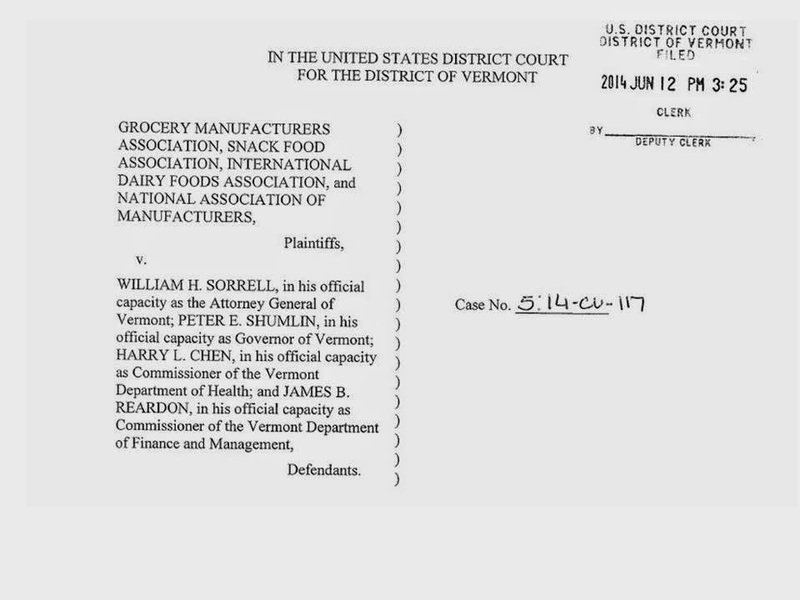 In fact, this is not Vermont's first experience with a lawsuit surrounding food labels, so one may say that the fund was set up based on "lessons learned". "The act is premised on a legislative finding that some consumers want to avoid food derived from genetic engineering because they distrust the FDA's findings or otherwise object to the use or prevalence of biotechnology in agriculture. The State does not purport to share those views, however, and it has exempted broad categories of foods that contain genetically engineered ingredients from these requirements". i.e. The plantiffs are asking "why do I have to label my products, but they don't have to?" I agree here. Doesn't make sense why some categories are exempt if your argument is "right to know". "The proscriptions in Act 120 are beyond Vermont's power to enact. The State is compelling manufacturers to convey messages they do not want to convey, and prohibiting manufacturers from describing their product in terms of their choosing, without anything close to a sufficient justification. The State is forcing the costs of this experiment on out-of-state companies and citizens to which it is not politically accountable, and it is undermining and impeding the federal government's interest in uniform, nationwide standards for food labeling prescribed by duly authorized expert federal agencies." i.e. The law is in violation of the First Amendment by forcing a company to say something that it doesn't feel like saying. (I guess that means that when I was a kid and my brother used to sit on me until I said that he was awesome was also a violation of my First Amendment rights...). Additionally, the plaintiffs are stating that labeling is regulated at a federal level, and it doesn't make sense for a state to start its own labeling requirements at the expense of everyone else. "We recognize and appreciate the strong interest that many consumers have in knowing whether a food was produced using genetic engineering. Currently, food manufacturers may indicate through voluntary labeling whether foods have or have not been developed through genetic engineering, provided that such labeling is truthful and not misleading. FDA supports voluntary labeling that provides consumers with this information and has issued draft guidance to industry regarding such labeling." What the...?? Where's Monsanto?? Every article I've seen in my Facebook feed and twitter feed is stating that Monsanto is suing Vermont? In fact, go ahead and google "Monsanto sues Vermont" and check out the gems you'll find. "Just hours ago, the world's most hated corporation got even more evil. Monsanto and its allies in the Grocery Manufacturers Association have just announced they're suing the tiny, rural U.S. state of Vermont to stop a new law that simply requires genetically engineered foods to be labeled. In fact, the mere threat of a multi-million dollar lawsuit nearly caused the state to back off the labeling law altogether. The SumOfUs community is already fighting Monsanto on every front, but we need to show Monsanto now that we won't be intimidated. We won't let Monsanto bully our elected officials into submission. Will you chip in to stand with Vermont and fight back against Monsanto?" Hellz yeah!! Who wouldn't be frothing at the mouth after reading that?? Except that Monsanto isn't part of the lawsuit. I cannot find an unbiased source of information that states whether Monsanto is a member of one of the organizations in the lawsuit, but I think we can assume they are. (Update here). However, if they are, I don't think they'd spend a lot of money on this legal battle because it's not really Monsanto's fight. This lawsuit belongs to Kelloggs, Nestle, CocaCola, PepsiCo, and others, who don't really need help from Monsanto in this one. Because Monsanto makes bags of seeds, such as these, which are brightly labeled and meet regulations. They don't make the cans of soup or Betty Crocker cake mixes, which would be affected by this legislation. "Thank you so much for your email and your question regarding our recent email to support Vermont as it begins its legal battle against Monsanto and its allies. SumOfUs is committed to helping the State of Vermont fight back, and that's where your donation truly makes a difference. We do not have a breakdown at the moment. Staff from the Vermont governor's office reached out to us directly before we ran this fundraiser, and we're talking with them about how we can best support the campaign. We're planning to make a very significant contribution to the legal defense fund on behalf of our supporters, but if we have enough funds it might also be strategic for us to continue to campaign outside of the legal process to defend this law and undermine Monsanto's position -- in strong consultation with our partners. Vermont is very aware that they won't be the last fight over GMO labeling in the US or around the world, and that other states need support too. You can be confident that your gift will go towards fighting Monsanto and defending this law in Vermont, including through the legal defense fund. But if you'd rather donate directly to the fund exclusively, then you can do so here: http://www.foodfightfundvt.org/donate-online"
So, my theory is that by putting Monsanto's name on this, it will help fuel their fundraising campaign. Because if I were to participate in a survey, and were to be asked, "What image comes to mind when you think of 'Grocery Manufacturers Association'? ", I'd say "Mr Hooper from Sesame Street". No idea why, but it's probably the word "grocer" in the phrase that evokes that memory. I'd be willing to bet that for the average American, the amount of money that they'd donate for a campaign against "MonSantan" vs a campaign against "Snack Food Association", would be very different. Additionally, nearly every company that sponsors the NFL is affiliated with the Associations in the lawsuit, so I doubt that they'd raise even half as much money if they listed "Snickers", "Tostitos" or "Cheetos" in this fundraising campaign. There you have it. I believe that you're being misled by this campaign. In the few hours that's it's taken me to write this, the fundraising campaign has gone from 19,000 individuals who have been misled to 21,000. In reading about Monsanto and trying to understand what they do, my stance at this moment is that Monsanto is like any other corporation in the world: trying to make good products, trying to maintain customer loyalty, and like any other long standing corporation in the US, they also have made mistakes and are learning from them. I think in this particular instance, Monsanto has done nothing wrong and it's depressing that it's named has to be invoked in order to raise funds under a false statement. Wanting to avoid the trait/protein that has been added. If that's the case, then demand labeling for the protein that has been inserted. Additionally, it doesn't make sense to label things like corn starch or sugar, where there's no trace of the transgenic protein or DNA from the crop left behind. Wanting to know the technology being used. If that's the case, then include a requirement to label foods developed through mutagenic entities such as radiation and mutating chemicals. Don't you have a right to know about those? Did you know that these can be labeled as "Organic"? Why do genetically engineered crops get singled out in this argument? The concern about allergens or other health impacts. If that's the case, you still need to know what protein/trait has been added. A blanket statement saying that a food may contain genetically engineered materials is too vague. Wanting to avoid pesticides/herbicides. If that's the case, then the producer should list the pesticides/herbicides used. That includes pesticides/herbicides used in organic farming. A desire to avoid products made by Monsanto and other "Big Ag" companies. Monsanto produces non-GM seeds as well, so a label stating that a foods "may contain GE" won't help. Wanting to avoid GE in general. If this is your argument, then just buy organic foods. Because in the end, that's probably what's going to happen: there will be foods labelled as organic, and then there will be everything else. Because producers won't be able to guarantee that GE crops aren't part of the mix. Just take a look at this excellent depiction of all the items that will need to change in the supply chain to make such a guarantee. Even Ben and Jerry's who is striving to go GMO free cannot find a source of milk that is not fed GM grain. Chipotle has had to go to Australia to bring in beef that is not grain fed (I've hypothesized that Chipotle has created a beef-teleportation device, which is why the beef from Australia is local and sustainable). I've read several arguments about how this debate can be compared to a desire for Kosher labeling or Halal labeling: there's a group of individuals who want a product with specific information or their food prepared a certain way, and then there's everyone else. It makes no sense to demand that everything be labeled. I'm drinking Diet Coke as I write this and the can does not say "non-Kosher", because that would not make sense. I completely agree with this argument and think that voluntary labeling is the way to go, and most importantly, I should not have to bear the cost of labeling for something that has no scientific merit or health concern. But, if you feel otherwise, feel free to contribute to SumOfUs.org's campaign to "bring down Monsanto". Just know that what you're really contributing towards is the legal fees (i.e paying for lawyers) due to a poorly designed piece of legislation whose legality was questionable from the get-go. As harsh as it sounds, I think that either the lawmakers or the citizens of Vermont should have to bear the burden of this one. Note: If anyone has information on Monsanto's contribution to the Associations that are part of this lawsuit, please let me know and I'll update the post with the appropriate links. I've written to the GMA to find out more and will update accordingly. (Information on Monsanto's membership in the GMA can be found here).